For the second year in a row, American Express Platinum will bring incredible exclusive access and experiences to life for Card Members during Miami Art Week at the Platinum House, curated in collaboration with American Express Platinum partners and Platinum Collective Members. Thursday, December 6th – Saturday, December 8th. · Equinox will bring complimentary, morning fitness classes to the private beach outside of Platinum House each morning for Platinum Card Members and Equinox Members. o Card Members must RSVP for Equinox classes. Reservations can be made beginning November 29TH here. · 11 AM: Writer and curator Kimberly Drew will host “Miami Art Mavens: A Conversation,” a discussion about the importance and influence of women in Miami’s creative scene in The Wing’s Little Cabana lounge within Platinum House. o No RSVP required. Seating is limited. First come, first served. o Tickets cost $75 per person and will be donated to Young Audiences Arts for Learning. Card Members may purchase ticketshere. · 8 PM: Platinum Creative Director, Pharrell Williams, will perform an exclusive concert for Platinum Card Members on Saturday, December 8th, 8 – 11 PM, on the beach. o Tickets cost $150 per person and will benefit Young Audiences Arts for Learning. Limit 4 tickets per purchase, available here. · Starwood Preferred Guest American Express Card Members will have access to a #spgamex party with DJ and Fashion Designer Virgil Abloh and graffiti artist Tony “Rubin” Sjöman across the street from the 1 Hotel South Beach at the W South Beach pool. o Audrey Gelman, co-founder of The Wing, will offer Platinum Card Members and Wing Women an oasis for networking opportunities in a pop-up “Little Cabana” lounge within Platinum House. o Tyler Haney, founder of Outdoor Voices, will gift attendees of the Equinox workout classes with a curated gift bag of Outdoor Voices gear. o Julia Kaganskiy, independent art curator and former director of NEW INC, will present a live drawing performance and installation at Platinum House from artist Sougwen Chung. o Sustainable fashion label Together California will debut exclusively at Platinum House an exciting new collection that features all sustainable textiles, made ethically in the USA. They’re invited by Sarah Andelman, founder of Just an Idea, who has helped bring an exclusive retail experience to Platinum House for the second time. § Proceeds from sales will benefit relief efforts for the California wildfires. o The Platinum Heat — a Platinum signature drink created in collaboration with Platinum Collective members Bertha Gonzales Nieves of Casa Dragones, Viraj Puri of Gotham Greens and Tobin Ludwig of Hella Cocktail Co. — will be served throughout the weekend as well. · Premium food and beverage offerings from American Express Global Dining Collection partner Planta. · Specialty cocktails from the Miami Centurion Lounge curated by renowned mixologist Jim Meehan. · Card Members will also get special dining perks as they explore Miami’s artistic hot spots by night, with food trucks serving tasty bites curated by Global Dining Collection chef José Andrés. Find these parked close to the action in Wynwood and the Design District, Thursday, December 6th—Saturday, December 8th. 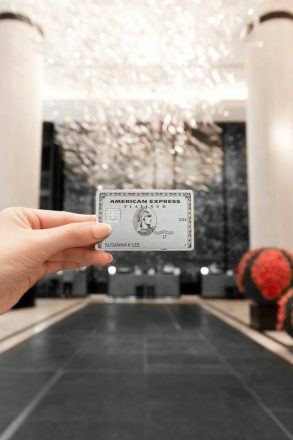 o Complimentary to Platinum Card Members plus two guests, and available for purchase for all American Express Card Members, proceeds will benefit Chef José Andrés’ non-profit, World Central Kitchen. · Platinum Card Members will also have access to exclusive previews of XYZT:Abstract Landscapes by Adrien M & Claire B, a new and buzzy exhibition at ARTECHOUSE Miami, courtesy of Platinum Collective Member Julia Kaganskiy. RSVP is required and Card Members may reserve a date and time slot here. WHO: American Express Platinum Card Members are welcome and can bring up to 3 guests.